JOHANNESBURG, 15 MARCH 2017 – South Africa’s major airports continue to receive recognition on the global stage. Durban’s King Shaka International Airport was last night named as Best Regional Airport in Africa at the Skytrax 2017 World Airport Awards presented in Amsterdam. Cape Town International Airport was listed at number 19 of the World’s Top 100 Airports while O. R. Tambo International came in in at number 37. King Shaka International Airport also scooped the Skytrax Award for Best Airport Staff in Africa, with second place going to Cape Town International airport, fourth place to O. R. Tambo International Airport, fifth place to East London Airport and ninth place to Port Elizabeth Airport. King Shaka International also took the award for Best Airport with under five million passengers a year. The 2017 World Airports Awards are a measurement of customer satisfaction across airports globally. As the benchmark for the aviation industry, the World Airport Awards are voted by customers in the largest, independent annual global airport customer satisfaction survey. The 2017 Awards are based on 13.82 million airport survey questionnaires that were completed by air travellers of 105 different nationalities during the survey period. The survey covered more than 550 airports worldwide. It evaluated traveller experiences across 39 key performance indicators from check-in, arrivals, transfers, shopping, security and immigration, through to departure at the gate. Airports Company South Africa chief executive officer, Bongani Maseko, congratulated management and staff of local airports named in the awards on their continuing efforts to improve the customer experience. “It is always wonderful to receive this kind of recognition, but all the more so when it is a reflection of a conscious business strategy. We have made listening to the customer a driving force within Airports Company over the past few years and have been implementing improvements based on what passengers tell us. It is therefore most pleasing that these awards continue to demonstrate our progress in listening, responding and providing an excellent customer experience,” says Maseko. The Skytrax Awards were announced just a week after three local airports excelled in the annual Airport Service Quality (ASQ) awards determined by independent surveys of some 600 000 passengers around the world. The ASQ awards are made by Airports Council International (ACI), the trade association of the world’s airports. ASQ is the only worldwide programme to survey passengers at the airport on their day of travel. 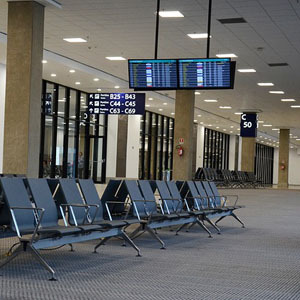 Bram Fischer Airport in Bloemfontein was named Most Improved Airport in the Africa region as well as the best airport serving under two million passengers a year. King Shaka International Airport and Cape Town International Airport took second and third places respectively in the ASQ awards for the best airport in the Africa region.